Ernest Tubb was born in Crisp, Texas, in 1914. His big success came with his self-penned number, "Walking The Floor Over You" in 1942, a million-seller that led to him joining the Grand Ole Opry in February 1943. 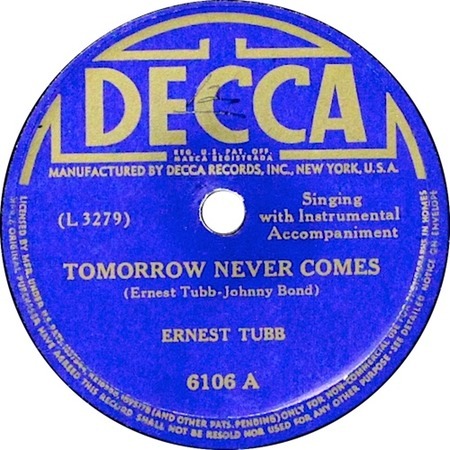 Tubb's original version of "Tomorrow Never Comes" was recorded in 1944 and released as a single on Decca 6106 the following year. Elvis's moody, dramatic interpretation of "Tomorrow Never Comes" contrasts greatlt with Tubb's inappropriately jaunty original version. There's another connection between Ernest Tubb and Elvis, apart from this song: Tom Parker, Elvis's (in)famous manager, acted as one of Tubb's advance promo men at the time he made his original version of "Tomorrow Never Comes." Ernset Tubb died in September 1984.